1. Must I register with SESAMi in order to respond e-RFQ /e-RFP? Answer: Registration is mandatory for all approved vendors. What are the benefits of signing up as a Registered Supplier ? Able to retrieve and manage RFQ, Tender/RFP, eliminating the problem of missing RFQs & Tenders/RFP’s and Quotations. Suppliers will be coached by our Professional Consultants to use our system. Suppliers will be given the chance to participate the business opportunities with other SESAMi large Buying Organisations (Singtel, CAG, NHG, STEE and SRC) through our e-Request to Participate (e-RTP) to RFQ and RFP published on our portal. 3. 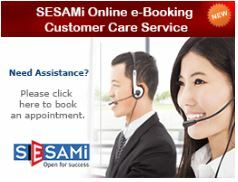 Do I need to pay to SESAMi for the registration with SESAMi to use the e-Procurement System? What are the fees applicable? * Annual Business Value (ABV) is the total PO value transacted between SATS and its Supplier through SESAMi system. The calculation of ABV for each billing cycle is based on rolling 12 months transacted PO value, ie past 12 months data from the month of billing. Notes: One month notice in writing is required for any termination request and an applicable reactivation fee $100 applies. The whole process will take 3-5 working days to complete (depends on response from Buyer on Vendor Code).